"Taisho" and "Taishō" redirect here. For other uses, see Taishō (disambiguation). It has been requested that the title of this article be changed to Taishō. Please see the relevant discussion on the discussion page. The page should not be moved unless the discussion is closed; summarizing the consensus achieved in support of the move. The Taishō period (大正時代, Taishō jidai), or Taishō era, is a period in the history of Japan dating from 30 July 1912, to 25 December 1926, coinciding with the reign of the Emperor Taishō. The new emperor was a sickly man, which prompted the shift in political power from the old oligarchic group of elder statesmen (or genrō) to the Imperial Diet of Japan and the democratic parties. Thus, the era is considered the time of the liberal movement known as the "Taishō democracy" in Japan; it is usually distinguished from the preceding chaotic Meiji period and the following militaristic-driven first part of the Shōwa period. On 30 July 1912, the Meiji Emperor died and Crown Prince Yoshihito succeeded to the throne as Emperor of Japan. In his coronation address, the newly enthroned Emperor announced his reign's nengō (era name) Taishō, meaning "great righteousness". The end of the Meiji period was marked by huge government domestic and overseas investments and defense programs, nearly exhausted cr, and a lack of foreign reserves to pay debts. The influence of Western culture experienced in the Meiji period continued. Kobayashi Kiyochika adopted Western painting styles while continuing to work in ukiyo-e. Okakura Kakuzō kept an interest in traditional Japanese painting. Mori Ōgai studied in the West and introduced a more modern view of human life. World War I permitted Japan, which fought on the side of the victorious Allied Powers, to expand its influence in Asia and its territorial holdings in the Pacific. Japan declared war on Germany on August 23, 1914, and quickly occupied German-leased territories in China's Shandong and the Mariana, Caroline, and Marshall islands in the Pacific Ocean. On November 7, Jiaozhou surrendered to Japan. With its Western allies heavily involved in the war in Europe, Japan sought further to consolidate its position in China by presenting the Twenty-One Demands (Japanese: 対華二十一ヶ条要求; Chinese: 二十一条) to the Government in January 1915. Besides expanding its control over German holdings, Manchuria and Inner Mongolia, Japan also sought joint ownership of a major mining and metallurgical complex in central China, prohibitions on China's ceding or leasing any coastal areas to a third power, and miscellaneous other political, economic and military controls, which, if achieved, would have reduced China to a Japanese protectorate. In the face of slow negotiations with the Chinese government, widespread anti-Japanese sentiment in China and international condemnation forced Japan to withdraw the final group of demands and treaties were signed in May 1915. Japan's hegemony in northern China and other parts of Asia was facilitated through other international agreements. One with Russia in 1916 helped further secure Japan's influence in Manchuria and Inner Mongolia, and agreements with France, Britain, and the United States in 1917 recognized Japan's territorial gains in China and the Pacific. The Nishihara Loans (named after Nishihara Kamezo, Tokyo's representative in Beijing) of 1917 and 1918, while aiding the Chinese government, put China still deeper into Japan's debt. Toward the end of the war, Japan increasingly filled orders for its European allies' needed war material, thus helping to diversify the country's industry, increase its exports, and transform Japan from a debtor to a cror nation for the first time. Japan's power in Asia grew following the collapse of the Imperial Russian government in 1917 after the Bolshevik Revolution. Wanting to seize the opportunity, the Japanese army planned to occupy Siberia as far west as Lake Baikal. To do so, Japan had to negotiate an agreement with China allowing the transit of Japanese troops through Chinese territory. Although the force was scaled back to avoid antagonizing the United States, more than 70,000 Japanese troops joined the much smaller units of the Allied expionary force sent to Siberia in July 1918 as part of the Allied intervention in the Russian Civil War. On October 9, 1916, Terauchi Masatake took over as prime minister from Ōkuma Shigenobu. 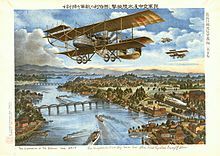 On November 2, 1917, the Lansing–Ishii Agreement noted the recognition of Japan's interests in China and pledges of keeping an "Open Door Policy" (門戸開放政策). In August 1918, rice riots erupted in towns and cities throughout Japan. The postwar era brought Japan unprecedented prosperity. Japan went to the peace conference at Paris in 1919 as one of the great military and industrial powers of the world and received official recognition as one of the "Big Five" nations of the new international order. Tokyo was granted a permanent seat on the Council of the League of Nations and the peace treaty confirmed the transfer to Japan of Germany's rights in Shandong, a provision that led to anti-Japanese riots and a mass political movement throughout China. Similarly, Germany's former Pacific islands were put under a Japanese mandate. Japan was also involved in the post-war Allied intervention in Russia and was the last Allied power to withdraw (doing so in 1925). Despite its small role in World War I and the Western powers' rejection of its bid for a racial equality clause in the peace treaty, Japan emerged as a major actor in international politics at the close of the war. The two-party political system that had been developing in Japan since the turn of the century came of age after World War I, gave rise to the nickname for the period, "Taishō Democracy". In 1918, Hara Takashi, a protégé of Saionji and a major influence in the prewar Seiyūkai cabinets, had become the first commoner to serve as prime minister. He took advantage of long-standing relationships he had throughout the government, won the support of the surviving genrō and the House of Peers, and brought into his cabinet as army minister Tanaka Giichi, who had a greater appreciation of favorable civil-military relations than his predecessors. Nevertheless, major problems confronted Hara: inflation, the need to adjust the Japanese economy to postwar circumstances, the influx of foreign ideas, and an emerging labor movement. Prewar solutions were applied by the cabinet to these postwar problems, and little was done to reform the government. Hara worked to ensure a Seiyūkai majority through time-tested methods, such as new election laws and electoral redistricting, and embarked on major government-funded public works programs. The public grew disillusioned with the growing national debt and the new election laws, which retained the old minimum tax qualifications for voters. Calls were raised for universal suffrage and the dismantling of the old political party network. Students, university professors, and journalists, bolstered by labor unions and inspired by a variety of democratic, socialist, communist, anarchist, and other Western schools of thought, mounted large but orderly public demonstrations in favor of universal male suffrage in 1919 and 1920. New elections brought still another Seiyūkai majority, but barely so. In the political milieu of the day, there was a proliferation of new parties, including socialist and communist parties. In the midst of this political ferment, Hara was assassinated by a disenchanted railroad worker in 1921. Hara was followed by a succession of nonparty prime ministers and coalition cabinets. Fear of a broader electorate, left-wing power, and the growing social change engendered by the influx of Western popular culture together led to the passage of the Peace Preservation Law in 1925, which forbade any change in the political structure or the abolition of private property. Despite the political realignments and hope for more orderly government, domestic economic crises plagued whichever party held power. Fiscal austerity programs and appeals for public support of such conservative government policies as the Peace Preservation Law—including reminders of the moral obligation to make sacrifices for the emperor and the state—were attempted as solutions. Although the worldwide depression of the late 1920s and early 1930s had minimal effects on Japan—indeed, Japanese exports grew substantially during this period—there was a sense of rising discontent that was heightened with the assault upon Rikken Minseitō prime minister Osachi Hamaguchi in 1930. Though Hamaguchi survived the attack and tried to continue in office despite the severity of his wounds, he was forced to resign the following year and died not long afterwards. The victory of the Bolsheviks in Russia in 1922 and their hopes for a world revolution led to the establishment of the Comintern. The Comintern realized the importance of Japan in achieving successful revolution in East Asia and actively worked to form the Japanese Communist Party, which was founded in July 1922. The announced goals of the Japanese Communist Party in 1923 included the unification of the working class as well as farmers, recognition of the Soviet Union, and withdrawal of Japanese troops from Siberia, Sakhalin, China, Korea, and Taiwan. In the coming years, authorities tried to suppress the party, especially after the Toranomon Incident when a radical student under the influence of Japanese Marxist thinkers tried to assassinate Prince Regent Hirohito. The 1925 Peace Preservation Law was a direct response to the "dangerous thoughts" perpetrated by communist elements in Japan. The liberalization of election laws with the General Election Law in 1925 benefited communist candidates, even though the Japan Communist Party itself was banned. A new Peace Preservation Law in 1928, however, further impeded communist efforts by banning the parties they had infiltrated. The police apparatus of the day was ubiquitous and quite thorough in attempting to control the socialist movement. By 1926, the Japan Communist Party had been forced underground, by the summer of 1929 the party leadership had been virtually destroyed, and by 1933 the party had largely disintegrated. Pan-Asianism was characteristic of right-wing politics and conservative militarism since the inception of the Meiji Restoration, contributing greatly to the pro-war politics of the 1870s. Disenchanted former samurai had established patriotic societies and intelligence-gathering organizations, such as the Gen'yōsha (玄洋社 Black Ocean Society, founded in 1881) and its later offshoot, the Kokuryūkai (黒竜会 Black Dragon Society or Amur River Society, founded in 1901). These groups became active in domestic and foreign politics, helped foment pro-war sentiments, and supported ultra-nationalist causes through the end of World War II. After Japan's victories over China and Russia, the ultra-nationalists concentrated on domestic issues and perceived domestic threats such as socialism and communism. Kofu city hall building of the second. Taken in 1918. Emerging Chinese nationalism, the victory of the communists in Russia, and the growing presence of the United States in East Asia all worked against Japan's postwar foreign policy interests. The four-year Siberian expion and activities in China, combined with big domestic spending programs, had depleted Japan's wartime earnings. Only through more competitive business practices, supported by further economic development and industrial modernization, all accommodated by the growth of the zaibatsu, could Japan hope to become dominant in Asia. The United States, long a source of many imported goods and loans needed for development, was seen as becoming a major impediment to this goal because of its policies of containing Japanese imperialism. An international turning point in military diplomacy was the Washington Conference of 1921–22, which produced a series of agreements that affected a new order in the Pacific region. Japan's economic problems made a naval buildup nearly impossible and, realizing the need to compete with the United States on an economic rather than a military basis, rapprochement became inevitable. Japan adopted a more neutral attitude toward the civil war in China, dropped efforts to expand its hegemony into China proper, and joined the United States, Britain, and France in encouraging Chinese self-development. In the Four-Power Treaty on Insular Possessions signed on December 13, 1921, Japan, the United States, Britain, and France agreed to recognize the status quo in the Pacific, and Japan and Britain agreed to terminate formally their Treaty of Alliance. The Washington Naval Treaty, signed on February 6, 1922, established an international capital ship ratio for the United States, Britain, Japan, France, and Italy (5, 5, 3, 1.75, and 1.75, respectively) and limited the size and armaments of capital ships already built or under construction. In a move that gave the Japanese Imperial Navy greater freedom in the Pacific Ocean, Washington and London agreed not to build any new military bases between Singapore and Hawaii. The goal of the Nine-Power Treaty also signed on February 6, 1922, by Belgium, China, the Netherlands, and Portugal, along with the original five powers, was to prevent a war in the Pacific. The signatories agreed to respect China's independence and integrity, not to interfere in Chinese attempts to establish a stable government, to refrain from seeking special privileges in China or threatening the positions of other nations there, to support a policy of equal opportunity for commerce and industry of all nations in China, and to reexamine extraterritoriality and tariff autonomy. Japan also agreed to withdraw its troops from Shandong, relinquishing all but purely economic rights there, and to evacuate its troops from Siberia. 1912: The Taishō Emperor assumes the throne (July 30). General Katsura Tarō becomes prime minister for a third term (December 21). 1913: Katsura is forced to resign, and Admiral Yamamoto Gonnohyōe becomes prime minister (February 20). 1914: Ōkuma Shigenobu becomes prime minister for a second term (April 16). Japan declares war on Germany, joining the Allies of World War I side (August 23). 1915: Japan sends the Twenty-One Demands to China (January 18). 1916: Terauchi Masatake becomes prime minister (October 9). 1917: Lansing–Ishii Agreement goes into effect (November 2). 1918: Siberian expion launched (July). Hara Takashi becomes prime minister (September 29). 1919: March 1st Movement begins against colonial rule in Korea (March 1). 1920: Japan helps found the League of Nations. 1921: Hara is assassinated and Takahashi Korekiyo becomes prime minister (November 4). Hirohito becomes regent (November 29). Four Power Treaty is signed (December 13). 1922: Five Power Naval Disarmament Treaty is signed (February 6). Admiral Katō Tomosaburō becomes prime minister (June 12). Japan withdraws troops from Siberia (August 28). 1923: The Great Kantō earthquake devastates Tokyo (September 1). Yamamoto becomes prime minister for a second term (September 2). 1924: Kiyoura Keigo becomes prime minister (January 7). Prince Hirohito (the future Emperor Shōwa) marries Kuni no miya Nagako Nyoō (the future Empress Kōjun) (January 26). Katō Takaaki becomes prime minister (June 11). 1925: General Election Law was passed, all men above age 25 gained the right to vote (May 5). Besides, Peace Preservation Law is passed. Princess Shigeko, Hirohito's first daughter, is born (December 9). 1926: Emperor Taishō dies; Hirohito becomes emperor (December 25). By coincidence, Taishō year numbering just happens to be the same that of the Minguo calendar of the Republic of China, and the Juche calendar of North Korea. ^ Nussbaum & Roth 2005, p. 929 at Google Books. ^ Hoffman, Michael (July 29, 2012), "The Taisho Era: When modernity ruled Japan's masses", Japan Times, p. 7 . ^ Bowman 2000, p. 149. ^ Dower, John W (1999), Embracing Defeat: Japan in the Wake of World War II, New York: WW Norton & Co, p. 21 . Bowman, John Stewart (2000). Columbia Chronologies of Asian History and Culture. New York: Columbia University Press. ISBN 9780231500043. Dickinson, Frederick R. War and National Reinvention: Japan in the Great War, 1914-1919 (Harvard Univ Asia Center, 1999). Nussbaum, Louis-Frédéric; Roth, Käthe (2005), Japan encyclopedia, Cambridge: Harvard University Press, ISBN 978-0-674-01753-5, OCLC 58053128 . Louis-Frédéric is pseudonym of Louis-Frédéric Nussbaum, see Authority File, Deutsche Nationalbibliothek, archived from the original on May 24, 2012 . This article incorporates public domain material from the Library of Congress Country Studies website http://lcweb2.loc.gov/frd/cs/.— Japan . Meiji Taisho 1868–1926 (in Japanese) .